I haven’t photographed a wedding at Montfair Resort Farm in almost five years and was so glad to have the opportunity to photograph Andrea and Christopher’s nuptials as they were blessed with exceptional sixty-five degree daytime weather and a beautiful backdrop of mountains, the lake, pastures, and my favorite – magical light. This particular photograph was taken in front of the bonfire that was set up next to the lake. 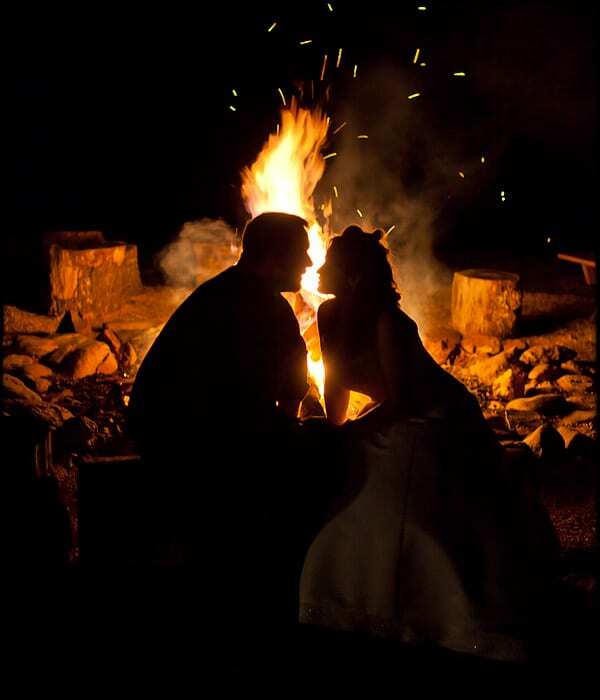 We walked down to the water just after sunset and I asked the bride and groom sit on a log next to the fire. I always get excited about new and exciting photography in the most dramatic of lighting conditions. There are a few things about this image that I personally find appealing. Andrea and Christopher are ever so slightly apart giving definition to their profile features against the background of the fire. The detail of the wood, rocks, and stumps made for a textured background and another layer. I pressed the shutter release three times before the wind changed directions and we had to quickly move. This was my favorite of the sequence due to the “S” curve of the fire in the background.